Retired US General Stanley McChrystal was frustrated. The US battle against the jihadist militant group ISIS (Islamic State of Iraqi and Syria) after the US occupation of Iraq was not going well. ISIS always seemed to be a step ahead of his forces. His forces took too long to process and act on intelligence – by the time the location of an ISIS cell was acted upon the location had long been abandoned. McChrystal was learning that the network structure of ISIS allowed them to adapt more quickly than US forces to avoid capture. While the US had overwhelming resources and a disciplined command-and-control structure, ISIS operated much faster – more like a group of separate franchises with a common purpose. The US Military in the early 21st century was one of the most efficient command-and-control organizations in the world. The organization prided itself on teamwork and trust amongst teams. McChrystal realized that this focus on efficiency and following orders unfortunately made them inflexible and slow to adapt – so slow that ISIS always seemed to be a step ahead. His teams developed more efficient decision making processes in order to keep up, but even with the best technology in the world they were not fast enough to catch ISIS leaders. The typical “command-and-control” organizational structure many of us are familiar with is best attributed to Frederick Taylor. Taylor founded the concept of “Scientific Management” in the late 19th century and early 20th century while managing paper and steel mills. He relentlessly focused on increasing productivity and used time and motion studies and simple scientific experiments with workers to determine the “one best way” to perform a task. Taylor’s book The Principles of Scientific Management was voted the most influential book of the 20th century by the Fellows of the Academy of Management. Taylor believed strongly in hierarchical structures. Workers were basically machines to Taylor – managers should tell workers exactly what to do and workers should follow established procedure and be paid by output. Henry Ford famously used Taylor’s scientific management thinking to create an efficient, but not flexible, process for mass producing automobiles. The command-and-control organizational structure enable 20th century industrialism and is clearly the prevalent structure in use at most large organizations today. But it was not effective against ISIS, and is not optimal for other organizations in the complex 21st century. 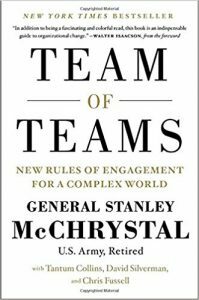 The new approach for McChrystal began by bringing team representatives together for sharing information in a command-of-teams structure. McChrystal established regular and consistent meetings for each team to report on their latest information. Teams quickly saw that the meetings provided value – so sent their best people to the (often virtual) meetings. The meetings helped build connections between different teams and establish alignment in purpose. The flattened structure and information sharing led to improved results but still required every major decision to be reviewed and approved by General McChrystal. This slowed down operations, and required lengthy explanation of facts before a decision could be made. McChrystal worked hard to trust the battlefield decisions his team made and would go along with his team’s input on nearly all the requests he received since his team members were always closer to the situation and privy to more information. McChrystal soon realized that he was the bottleneck in his command-and-control structure decision making process, and the best solution was to further decentralize teams. The new structure worked wonderfully. Becoming a more efficient command-and-control organization had allowed the team to increase monthly raids from ten to eighteen. Many organizations would be happy with the 80% increase, but that was not enough to win the war. Using the team-of-teams strategy, the monthly raids skyrocketed to three hundred! More importantly, decisions were made fast enough to begin capitalizing on information obtained from captured ISIS leaders. So why did decision making work so effectively in the team-of-teams structure, and what traits should an organization emphasize if converting from a command-and-control structure? The flexible and adaptable team-of-teams structure is based on concepts from game theory. Game theory is the science of logical decision making in humans and computers developed in the 1950s. Game theory examines decision making when relationships are involved – when a logical decision is affected by another person’s decision. A sub-optimal action by an individual may lead to the best outcome for the group. Check out the video below for a brief summary of game theory if you’d like more information. Game theory applies when dealing with ISIS and also when dealing with a frustrated customer. McChrystal shares several popular stories of customers sharing a negative experience on-line . . . and having the story go viral. An employee monitoring social media can often solve the customer issue quickly and for a low cost. Waiting for management approval allows sharing and reposting – all damaging to the brand. Evolving from a traditional command-and-control organization to a team-of-teams organization will provide significant benefits, but is not easy. The transformation requires trust and a common purpose, strong team bonds, a commitment to real-time information sharing, and an emphasis on purpose over procedure. The key reason for the success of empowered execution in the team-of-teams structure is the foundation of shared consciousness. For decentralized teams to make quick decisions that were optimal for the group, they had to understand the entire group. 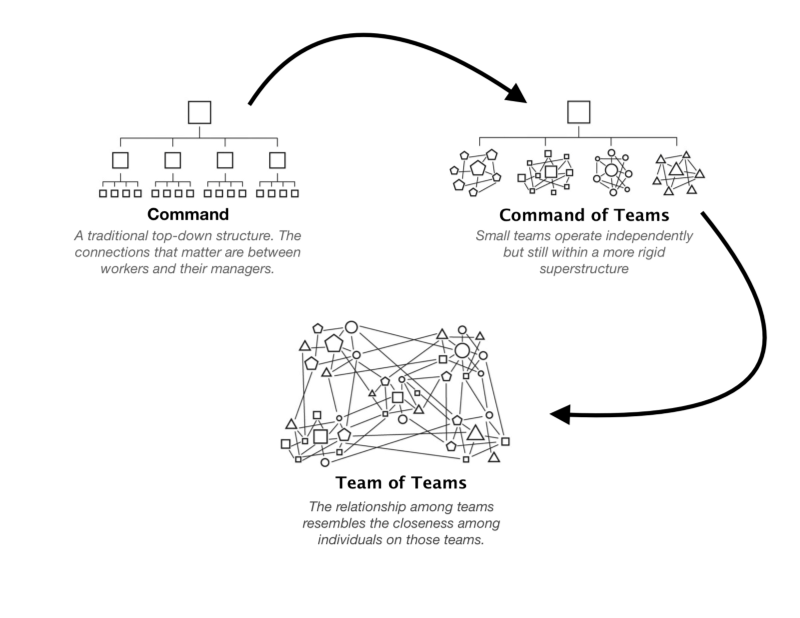 Organizations should not attempt to transition directly from a command-and-control structure to a team -of -teams structure. Establishing a command-of-teams structure is an important intermediate step in success. For McChrystal, the separate teams quickly learned that sharing information was valuable to the mission and provided alignment in purpose. This step allowed trust to develop over time. The meetings shared information while also providing numerous opportunities for leadership to emphasize purpose. One mistake leaders make when empowering their staff is not establishing a clear purpose and vision. Another is withholding information. How can a leader expect his/her subordinates to make proper decisions with only half of the information? Empowerment must be about purpose, not procedure. Taylorism held that managers were the “thinkers” and workers were the “doers.” Complicated problems were dealt with by workers following established procedure. The complex world of today changes too quickly for managers and their procedures to keep up. Going back to the earlier example, knowing that your social media based complaint is from a user with 250,000 followers might require a different response than “normal procedure.” It is better for managers to share the purpose with their teams and allow employees to react accordingly. Lean thinking focuses on the best current method for a process to provide customer value. Some of Taylor’s methods are still taught and used today, including using data-driven experiments, or tests of change, to evaluate improvement ideas. The difference is each and every worker (not just the manager) should understand the purpose, have the information required, and be able to make and evaluate simple changes. It is time to move away from command-and-control management, sharing purpose and knowledge while extending trust to every worker. Only organizations that do will be positioned to succeed in today’s complex world.